Class size is limited. When a class fills up, applicants form a waiting list, which is first-in-first-out. We're always iterating in response to the evolving market trends in technology. You'll learn the hottest tools of today, but more imporantly you'll gain a lasting foundation for the tools of tomorrow. Our instructors are actual software engineers with plenty of real world experience. You'll be learning from industry experts, supported by ownership and staff who sincerely care about your success. While this is an in-person program, each class is recorded and available online so students can review. Now it's easier to catch up if you have to miss a class. From exposure to our growing network of employers, to resume reviews and mock interviews, our dedicated Career Services Team is here to help you throughout class and into the job search. Applications with no back-end are limited in their functionality, thus the demand for "full stack" developers: mySQL, Node.js, Express, Linux, Terminal, Npm Modules, Get & Post, HTTP, Amazon Web Services, etc. At DigitalCrafts, you will learn the most cutting edge technologies on the market today. More importantly, you'll learn how to continue learning, so you can stay cutting edge for the market tomorrow. Yes, it's takes a lot of drive, but the Full Stack Flex Program is designed with working professionals in mind. What happens if I miss class? Can I attend remotely? While in-person attendance is mandatory, we know that life sometimes gets in the way. That's why we live stream and record each class for review and/or catch up. Please note: students must adhere to the attendance policy in order to qualify for a certificate upon completion. We're big believers in the brick-and-mortar classroom, and there's just no substitute for learning alongside your peers. 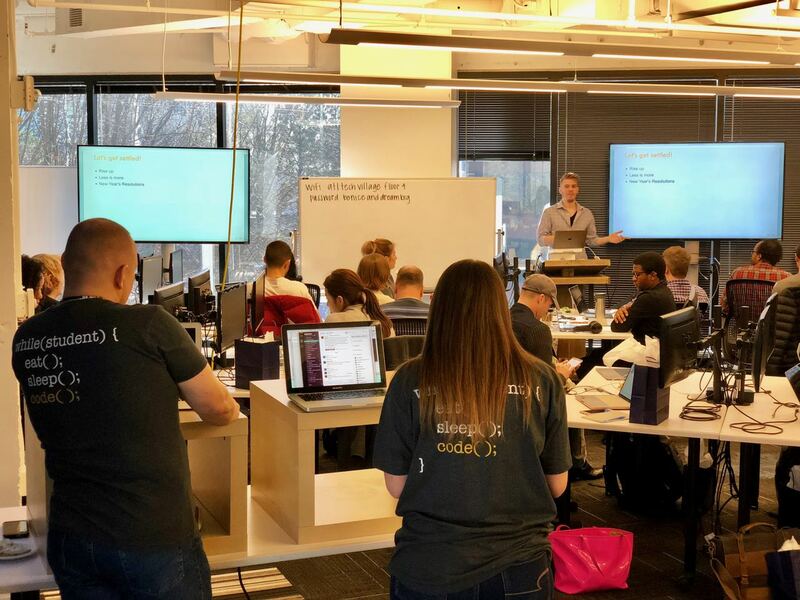 Our Full Stack curriculum is crafted with beginner to intermediate coders in mind. While no prior experience is required, the more self-study before class the better. This is especially true for the Flex Program, given the part-time format and self-guided work required. How much is tuition? Are there installment plans? Base tuition for the Flex program is $9,500. A $1,000 deposit is required to secure your seat. The remaining balance of tuition (after your deposit) may be paid in full before class starts, with 4 installment payments throughout class (processing fee applies), or it can be financed over 3 to 5 years through our partner, Skills Fund. Discounts and Scholarships: If you apply, are accepted, and secure your seat by the early enrollment deadlines listed on our schedule, we will take $250 off tuition. If you enroll within 5 business days of being accepted, we'll take an additional $250 off tuition. Alternatively, you may qualify for one of our scholarships! We're proud to award partial scholarships to women, veterans, and builders with especially inspiring stories. Currently, our average class size is ~17 students, ranging between 10 and 24. Your cohort may have more or less, as there is some seasonality in enrollment, but we always maintain an efficient and effective classroom environment. What equiptment do I need? We strongly advise using Mac computers in class, but it's not required for Flex students. Using a Mac helps ensure that our instructors will be able to debug any issues that are specific to your operating system. Other than that, all of the software we'll use is freely available, and we'll provide the external monitor to keep the code flowing. Will I be a member of Atlanta Tech Village / Headquarters as a student? 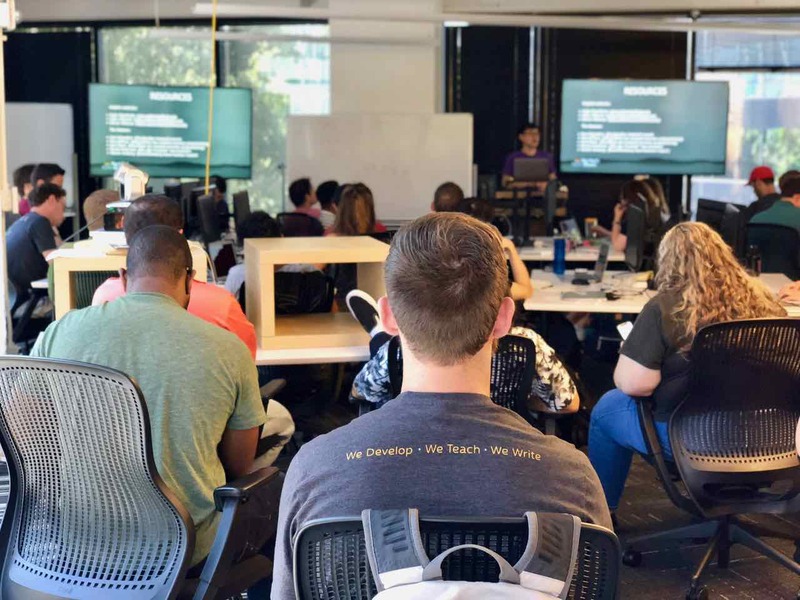 Atlanta: All of our Atlanta students, Immersive and Flex alike, are members of Atlanta Tech Village (ATV) for the duration of class at no extra cost (a ~$2,600 value for Flex students). This means 24/7 access to the building, an onsite fitness center, free beer, snacks, Friday lunches, a killer rooftop patio, and access to networking and mentorship opportunities geared towards technology entrepreneurs. Stop by anytime and say 'hey' to the alumni working for startups in the building! Houston: Our Houston students will be members of The Cannon Houston for the duration of class, but will only have access to the building during class hours. Parking is free as well, which is a big perk in Houston! Flex students may opt in to receive the same career support as our Immersive students, which includes portfolio guidance, mock interview practice, and exposure to our ever-growing list of employer partners. In addition, our dedicated Career Services Coordinator is available to provide detailed feedback on everything from cover letters and resumes, to projects, portfolios, and emails to employers. Is the Flex Program available in Houston and Atlanta? You may have noticed universties around the country beginning to offer bootcamps of their own. It's not our way to speak ill of competitors, but we do want to provide some much needed transparency to prospective students evaluating these programs. The "university" bootcamps are (almost) all taught by the same 3rd party for-profit company. The employees you interact with (admissions team, instructors, teaching assistants, career services team) do not work for the university, but rather for the 3rd party company. The university simply lends its brand, color scheme, and then shares in the profit. Also, because the university receives as much as 50% of the profit, they have to pack far more students in the classroom to make it finacially viable for both parties.